I never thought it would get done, but it's officially DONE!! I started working on pieces over the summer, but it got cold so fast and then I got pregnant!! So, needless to say I am a little behind on things! I am finally feeling better and I'm back in project mode. 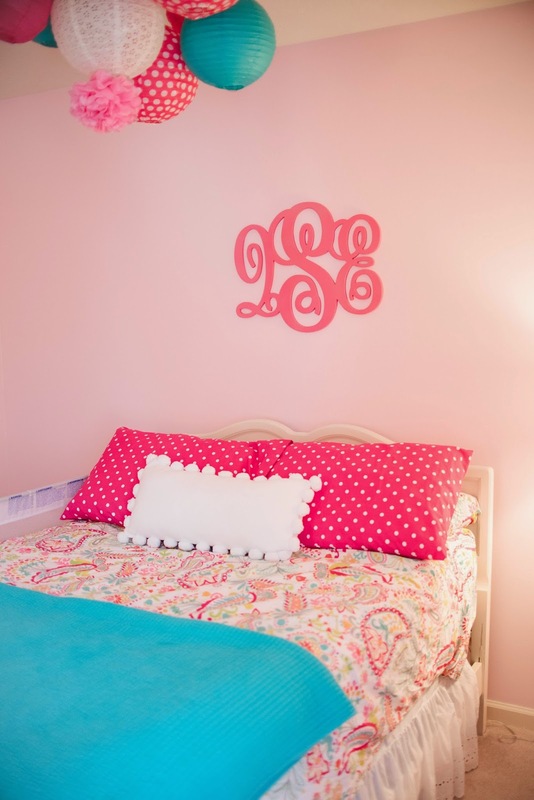 Please enjoy the tour of my little princess's simple and sweet bedroom. Every piece you will see has been redone by yours truly. I found the clothes rack at Imagine That in Mishawaka. I bought it for 10 bucks and sprayed it pink to match her monogram. She hangs her princess nightgowns on it!! The antique mirror was my husband's grandmother's. It needed to be cleaned up. I simply added a little spray and then distressed it. We hung it at Quinny's level and now she has her own little place to get dressed. Her bedding was purchased from Pottery Barn Kids. I went with the paisley and polka dots to add some contrast! The teal quilt came from TJ! I love how the chandelier of paper lanterns turned out! It ties all of the patterns together (it took forever to get the correct placement)! Here's a before pic of the bed frame I made Quinny sand for me!! LOL I actually spray painted the bed with a beautiful creamy white color. It was much easier than hand painting!! The monogram came from ETSY. The man had it done and sent out within a few short weeks! I painted it pink and added some glitter for girly sparkle! A friend passed this end table on to me. Fresh coat of paint to match the bed and dresser... new knob... tada! The artwork was found super super cheap at a Furniture Store that was going out of business. The shelves came from Pottery Barn! Of course we needed more hooks for our dress ups! Quinny loves tea parties! I found this cute little table and chairs at an online garage sale site and the table came from my amazing neighbor!! I think it looks much better now! HA! We have countless tea parties in her bedroom. This was always a dream of mine. Just me and my princess. Here's the before and after of the dresser (found on the side of the road)!! I sanded, painted, added new hardware, and my mom found the perfect baskets from Target to fit inside where the preexisting drawer was. I had another neighbor make the adorable polka dot runner for me! It was the perfect touch! I'm telling you I have the best neighbors!! That's about it!! Lots of projects, but I enjoyed doing them all. It's always fun when the hard work pays off! I love it and she's happy, too, so it's a win win! Thanks to my Dad for helping me paint the room, Larry Clifford for finding the dresser for me, Joyce for the table, Cyndie for making the runner, and Meredith Santucci for taking the pictures!! It takes a village!! Love you all!! You guessed it... WELCOME TO FLOURISH BOUTIQUE!!! Home of the famous patterned leggings!! I think this is one pattern of like 100!!!! Seriously, their pictures, models, and clothes speak for themselves!!! How about these edgy faux leather leggings? Love. Them. FLOURISH is also known for their Holiday Dresses. This blue dress is stunning! I definitely bought this amazing fur vest, but in black!! Andddddd I maybe bought the plaid shirt to go under!!! I love, love, love simple and cute sweaters! This heart sweater is adorable! Keep it simple and pair it with jeans or dress it up and pair it with black pants and a blingy necklace!!! This sequin elbow cardigan is on my Christmas List! Santa, I promise I have been good! Ohhhhhh!!!!!!! Look at this adorable skirt! Anything black and white is eye-catching! This top is to-die-for. The colors are rich and the back is amazing. Here's that vest again! This time paired with the open back, off white shirt! I love when you can purchase a piece that can be worn in numerous different ways!! Who doesn't love cute t-shirts?? I love being able to dress comfy, but still cute! Plaid and flannel again... this time in a coat!!! I could buy every single item in this store. This has always been one of my favorites!! Vanessa, the owner has come along way. FLOURISH has only been in their new building for a few months and it is amazing. The space, the style, the decor, the glitter floor, the leopard carpet.... oh I could go on and on!! The FLOURISH girls are exceptional. You will get the royal treatment here; they will help you find that perfect outfit or perfect gift for someone special! The other reason I love FLOURISH??? They always have sales!!! Catch their big sale tonight before it's too late!!!! BOGO is back, baby!!! I am pretty bias about my favorite local shop #4! I have known Ali for about 8 years. I have watched her little shop at The Market grow into a huge shop On the Boulevard. Ali, you are my role model!! It is your customer service that brings people back every WEEK!! I was fortunate enough to have Ali design my Wedding jewelry as well as to gain a wonderful friend in my life. Isn't she the cutest??? Kudos to you, Ali, for all of your hardwork and dedication to your passion and your customers!! Sooooo as I said earlier... Ali started out with a cute little booth at The Farmer's Market which solely sold jewelry. As the years have gone by and Ali's business has grown, she now has clothes!! Her style is what I call comfy, cozy, and classy!! Being a mom of two, I find that her clothes are the staple to my everyday wardrobe!! Check out some of the cuties she has in the shop right now!! Ali's style is simple, affordable, and so darn cute!! I always start with a solid color tee and add one of Ali's pieces to bring my outfit together!! This sweatshirt below is so comfortable! Layer some of Ali's jewels and you're set! I adore these poncho sweaters!! They are soooo cute!! The designs and colors are breathtaking! I own two of these shawls!! You can wear them in about 5 different ways. These are my go to for fall days as well as church!! I've told you in my other posts... flannel and plaid are in!! Add a scarf, a necklace, and sweater for more oo la la!! Next time I am in the shop this will be my purchase!! I love the detail in the sleeves!! Sooo cute!! These boot socks are too too cute with all those frills!! Dress up any plain jeans and boots with a pair of these! Ali is really big on finding preloved items!! She has sweaters and these new leg warmers!! They are all different and unique!! I usually splurge each year and buy a new headband and scarf for my winter coat. She always has different ,one-of-a-kind pieces!! Love this sweet, houndstooth scarf! Ali also has hats, dresses, leggings, candles, home accessories, vintage jewelry, and even a small section for men!! I love visiting her shop. You can go once a week and it still wouldn't be enough!! She gets new arrivals daily!! Check out her new "Holiday Have to Have." I can send the hubs in and he will know exactly what I want/need!!!! Please go visit Ali!! She is a hoot! You are sure to find something special in either one of her adorable shops!! I know! I know!! I'm two days behind!! My apologies... I have been down with a cold! Yuck!! This winter season came way too fast! Ugh! Anyways, back on task... my third favorite local shop is On The Fringe! This is what I call the "secret boutique." It is quaint and small and connected to Bangs Salon and Spa, but it is exactly what their sign says... "Unique!" When I have an event to go to or my husband and I finally get a night to ourselves... this is where I go! The prices are spot on, the quality amazing, and the uniqueness is my favorite!! You are sure to get a compliment in an outfit from On The Fringe! They have more scarves than I have ever seen in a shop!! These are what I call the "decorative scarves." These are your "pop" in your outfit!! I love this fur one!! They have two colors. Fur is huge this year... fur scarves and vests... umm yes!! These are like 1/3 of the variety! They have handmade, infinity, Notre Dame, you name it!! These are adorable!! These are the handmade gloves with room for your fingers! I have always had a hard time finding gloves because I think they are itchy and bulky. These are comfy and light weight!! Perfect for driving, talking on the phone, and/or a cup of coffee!! Sweater socks!!! So many styles... these are perfect to pair with jeans or tights! These will be your statement piece!! Sooo darn cute! Patterns are in this winter!! They are so easy to dress up!! Black tights, black leggings, even a black shirt under and you're done! I love easy wardrobes!! The On The Fringe Babes are so good at putting outfits together! This is what I call a grab and go outfit!! Don't you love having it all together for you? This is one of many purses they carry! They have leather, fringe, leopard, reversible.... YES, reversible, and even wine purses!! What woman doesn't need a new purse? They have the cutest recycle bags, too! I use these for my gift wrap!! Two gifts in one... thank you very much!! The jewelry selection is to die for! Bangles, bangles, and more bangles. The necklaces are striking. They can literally make your dull black dress stand out!! How cute is this owl necklace turned watch!?!? Ahhh!! These are necklaces you can create yourself!! On The Fringe also has a men's section!! That right there is "Pete, the Pizza Cutter!" Isn't that hilarious? You can definitely keep him out in the kitchen at all times! Pizza is a staple in our house on Fridays!! There's a new collection of men's underwear and even money clips!! Don't worry... there's a baby and child section, too! These aden and anias sets are so popular!! Magnetic sets are perfect for church or the car!! Too cute! I have one of these quote books for each kid!! Oh and those spoon things... they are to spread the Desitin so it doesn't get on your hands! BAHAH!! I know, right!?!? On The Fringe girls have quite a sense of humor! These are Poo-Potpourie spray fragrances! Check out On The Fringe!! They don't get a lot of one piece so if you love it, you better buy it!! I guarantee it will be gone! This is just a small selection of what they have! Their Christmas selection is adorable and funky, too! Their store is a must see!! You can visit On The Fringe right on Ironwood in the same complex as Women's Care Center!! You can check them out on facebook, too! !